A new law requiring private security guards to check their guns at work will take effect at the start of the upcoming school year. Public Security Minister Yitzhak Aharonovitch issued orders for security guards to leave their guns at work four months ago, following fatal shooting incidents by security guards on civilians. The killing of the Gornos in the attorney’s office was the fifth fatal shooting by a security guard’s weapon this year. Security guards working in schools and financial institutions will now have to store their guns in a safe on the premises. 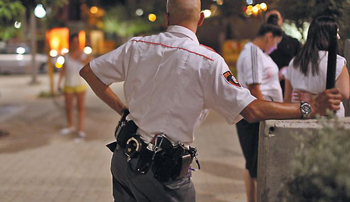 Business owners and organizations who employ security guards have been instructed to make sure the guards check in their weapon at the end of their shift, or hand it over to the guard who relieves them. Security companies, security facilities and other organizations nationwide currently have in their possession some 130,000 weapons, some 40,000 of them held by security guards. However, security guards who live in places classified as “confrontation areas” will be allowed to take their gun home with them. In the past, schools and banks objected to keeping guns on their premises, for fear of burglaries. School principals said they did not like the idea of having guns in educational institutions. The ministry also drafted tougher rules for obtaining gun licenses, with the intention of reducing the number of weapon holders.